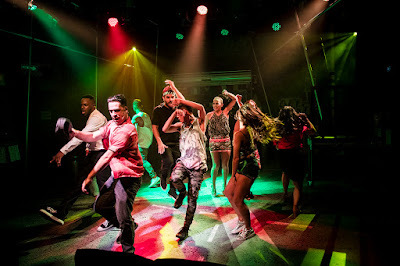 Blue Saints Productions, in association with Hayes Theatre Co presents, IN THE HEIGHTS, Music and Lyrics, by Lin-Manuel Miranda, Book by, Quiara Alegria Hudes, at the Hayes Theatre, Greenknowe Ave. Potts Point. 16 MKarch - 16 April. IN THE HEIGHTS is an American Musical that first saw the light of day in 2005 and arrived on Broadway in 2008. It was nominated for 13 Tony Awards, and won 4, including Best musical. This work was conceived by Lin-Manuel Miranda, who also wrote the Lyrics and Music, and is centred on a corner of shops in Washington Heights, a borough to the North of Manhattan, occupied by an Hispanic community. We meet the hard working neighbourhood denizens, through the rap/hip-hop of our narrator and 'hero' Usnavi (Ryan Gonzalez) - himself running a coffee/drink stall - who are all on the edge of change, and we watch, over the two and a half hours of the show (interval included), a generational story where we see the old and the young fighting to maintain and protect what they have on the one hand, and breaking free on the other. It is a story we have met before - the Book by Ms Hudes is a bit predictable/ordinary - but is different in this instance as it is told through the vibrant culture of Spanish-speaking dreamers of the American Dream in an innovative and uniquely witty musical language incorporating rap and hip-hop and a salsa fusion. It is a kind of NORTH SIDE STORY without Bernstein - it is interesting to note that it was Mr Miranda who provided the Spanish lyrics for the Puerto Rican gang, The Sharks, in a recent Broadway production of WEST SIDE STORY - his witty lyrics for IN THE HEIGHTS, a boon for this show. Although, for my ear, we don't have the variety of musical language of the Bernstein opus, we do have instead a vibrancy of musical score that excites as a curious and exotic 'learning', that is thrilling in its own vocabulary. On the Hayes stage it is explosively commanded by Lucy Bermingham, the Musical Director, with arrangements of the music that thrill and vibrate the Hayes space with an energetic propulsion that like a cyclonic wind lifts the performers into ecstatic states of song belief and choreographic 'violence' of breathtaking daring. The Choreography by Amy Campbell is excitingly dangerous, delivering the first act climax in THE CLUB with punch, pizzaz and a movement language that has a kind of elegance of execution from the performers that leaves one breathless and dazzled. Director, Luke Joslin has cast actors that can walk the walk, talk the talk, song the song, and dance the dance - not a moment of doubt, not a faltering of courage is detectable - commitment from all is 'full-on'. Ryan Gonzalez (Usnavi) - this is his second offer on the Hayes stage this year, his virtuoso drag queen (Freddy/Aurora Whoreaelis) in THE VIEW UPSTAIRS was a similar knock-out - Olivia Vasquez (Vanessa), Tim Omaji (Benny), Luisa Scrofani (Nina) all carry confidently, brilliantly, the opportunities of the 'music/play' with great support from Samantha Bruzzese, Libby Asciak, Will Centurion, Monique Montez, Michelle Rozario, Stephen Tannos and Richard Valdez. Whilst, I have never heard Margi De Ferranti (Abuela Claudia) better - her song 'Paciencia y Fe' (Patience and Faith) a highlight of act one; and the volatile characterisation by Ana Maria Belo (Camilla) is startling, her song, 'Enough', a comic piece of bravura; with added winning turns of complete believability from Marty Alix, giving a 'reading' of Sonny of complex accuracies and charm, and Alexander Palacio, as Kevin, a fortress of dignity in the turbulence of his character's life's ambitions (beauty in his vocals). This company of performers can hardly be faulted. The Design elements, the Set by Simon Greer, seems to create space like the amazing Tardis of Dr Who - an illusion of vastness - and so much more convincing than the recent CARMEN for Opera Australia, I thought. The costumes by Elizabeth Franklin, are colourful, demarcating character and providing practicalities for the huge needs of the show with craft and insight. The 'champion' of the Design creatives, however, must be the nuanced Lighting Design from Trudy Dalgleish, that covers general atmospheric deliberation balanced with an intimacy of detail that catches the faces of the actors to keep the story pointed - a small 'miracle' accomplished on this difficult stage. This Production of IN THE HEIGHTS, has been brought to the Hayes Theatre through the production house of Blue Saint: Josh Robson and Damien Birmingham. This work meets and surpasses their previous gift: the award winning VIOLET. On the web site I see that this show has already extended its season and Sold Out - Returns maybe your only chance - I should beg, borrow, or definitely, pull those favours to get a ticket, if I were you. IN THE HEIGHTS, is the pre-cursor of Lin-Manuel Miranda's HAMILTON. I hope it doesn't take ten years, like this production, before we get to see it in Sydney. P.S. In the live mix of the Sound Design by Anthony Lorenz, is there a way for the lyrics to be more 'front and centre'?